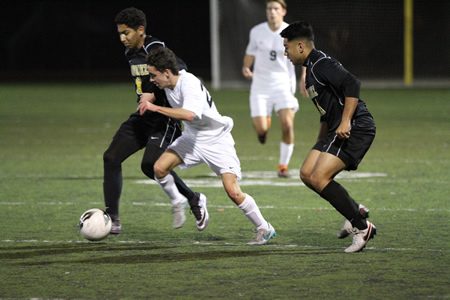 Breakers played their best last Friday, Jan. 29, at Guyer Field almost taking down three-time league champion Godinez (SSCIF D4 # 1) before falling 2-1. Breakers faced Costa Mesa and Saddleback this past week. Breakers held off a tough Godinez squad 1-0 on Thursday, Jan. 28, at Guyer Field to stay in the title race with Estancia (4-1-1) and Calvary (5-0-1). Breakers hosted Costa Mesa this past Tuesday, Feb. 2, and traveled to Saddleback on Thursday, Feb. 4, for this past week’s action. The title hopes should come down to the match at Estancia on Monday, Feb. 8, and the home match verses Calvary on Wednesday, Feb. 10. SSCIF Rankings for D-5 as of (2-1): 1 – Sierra Canyon, 2 – Oxnard, 3 – La Serna, 4 – Calvary Chapel/SA,5 – California, 6 – Alta Loma, 7 – Ocean View, 8 – Laguna Beach, 9 – Palm Desert, 10 – La Quinta/La Quinta & Tahquitz (tie). soccer is a beautiful game and I love this game very much and i play it since childhood.